Exponential smoothing models are simple, accurate and robust forecasting models and because of these they are widely applied in the literature. Holt's linear trend method is a valuable extension of exponential smoothing that helps deal with trending data. In this study we propose a modified version of Holt's linear trend method that eliminates the initialization issue faced when fitting the original model and simplies the optimization process. The proposed method is compared empirically with the most popular forecasting algorithms based on exponential smoothing and Box-Jenkins ARIMA with respect to its predictive performance on the M3-Competition data set and is shown to outperform its competitors. Assimakopoulos and Konstantinos Nikolopoulos. The theta model: a decomposition approach to forecasting. International journal of forecasting, 16(4):521-530, 2000. George EP Box, Gwilym M Jenkins, and G Reinsel. Forecasting and control. Time Series Analysis, 3:75, 1970. Robert Goodell Brown. Statistical forecasting for inventory control. McGraw/Hill, 1959. Jan G De Gooijer and Rob J Hyndman. 25 years of iif time series forecasting: a selective review. Tinbergen Institute Discussion Papers No. TI, pages 05-068, 2005. Everette S Gardner. Exponential smoothing: The state of the art. Journal of forecasting, 4(1):1-28, 1985. Everette S Gardner. Exponential smoothing: The state of the art-part ii. Interna- tional journal of forecasting, 22(4):637-666, 2006. Everette S Gardner Jr and ED McKenzie. Forecasting trends in time series. Man- agement Science, 31(10):1237-1246, 1985. Paul Goodwin et al. The holt-winters approach to exponential smoothing: 50 years old and going strong. Foresight, 19:30-33, 2010. C Holt. Forecasting trends and seasonal by exponentially weighted averages. Inter- national Journal of Forecasting, 20(1):5-10, 1957. Rob Hyndman, Anne B Koehler, J Keith Ord, and Ralph D Snyder. Forecasting with exponential smoothing: the state space approach. Springer-Verlag, 2008. Rob J Hyndman, Anne B Koehler, Ralph D Snyder, and Simone Grose. A state space framework for automatic forecasting using exponential smoothing methods. International Journal of Forecasting, 18(3):439-454, 2002. Spyros Makridakis, A Andersen, Robert Carbone, Robert Fildes, Michele Hibon, Rudolf Lewandowski, Joseph Newton, Emanuel Parzen, and Robert Winkler. The accuracy of extrapolation (time series) methods: Results of a forecasting competition. Journal of forecasting, 1(2):111-153, 1982. Spyros Makridakis and Michèle Hibon. Exponential smoothing: The effect of initial values and loss functions on post-sample forecasting accuracy. International Journal of Forecasting, 7(3):317-330, 1991. Spyros Makridakis and Michele Hibon. The m3-competition: results, conclusions and implications. International journal of forecasting, 16(4):451-476, 2000. Spyros G Makridakis, A Andersen, Robert Carbone, Robert Fildes, Michele Hibon, Rudolf Lewandowski, Joseph Newton, Emmanuel Parzen, and Robert Winkler. The forecasting accuracy of major time series methods. Wiley, 1984. C Carl Pegels. On startup or learning curves: An expanded view. AIIE Transactions, 1(3):216-222, 1969. James W Taylor. Exponential smoothing with a damped multiplicative trend. International journal of Forecasting, 19(4):715-725, 2003. Guckan Yapar. Modified simple exponential smoothing. Hacettepe University Journal of Mathematics and Statistics, Early access:0, 2016. Institution: DOKUZ EYLUL UNIVERSITY, FACULTY OF SCIENCE, DEPARTMENT OF STATISTICS, STATISTICS PR. ISNAD Yapar, Guckan , Capar, Sedat , Selamlar, Hanife Taylan , Yavuz, Idil . "Modified Holt's linear trend method". 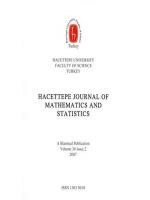 Hacettepe Journal of Mathematics and Statistics 47 / 5 (October 2018): 1394-1403.